Many times we come up with certain excruciating points where one wishes to get sick, like going to school, giving exams or even going for work. At that point of time you need a real quick and snappy solution. Here are some techniques learned from great and vivid experience and tested successfully in multi-risk scenarios. Do you like a hot cup of cappuccino on a hot day? Okay we know you don't. But here's the trick, try the hot coffee and the within 'Three Minutes' (And that's very important) you proliferate your throat with any impeccable flavor of Ice-Cream. Now that can be too dangerous 'coz the impact may be too severe than expected. But for sure the reason would be equally bad. Whenever possible use the anything in immediate sight used by the Source. If the Source is your partner, you know what else can help. Never try any of the source's medication until it is EMERGENCY. More than one Source is always better. Furthermore, Never waste you time on the sources with diseases you have never heard of, the may be non-communicable and may prove useless. On a cold night, you may try wetting your hair and sleep under the fan. You'll feel the heaven next day. This works well and easy, and will even improve in two days. On a hot day, take out your winter clothings, and put on some woolen socks and sleep under two blankets. This requires a little bit of effort but it will bless you the next day. You may feel little dizziness and fever, but will end soon. 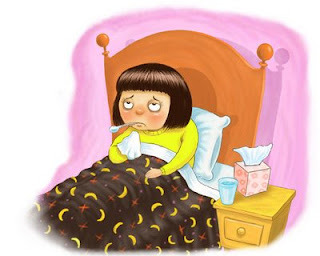 There's an famous old saying 'The sick catches the flu first!' So if after trying some of these tricks you'll start feeling sick soon, so all you have to do is to vigorously apply the other techniques which will again enhance the pace thus it goes on and on.